In The Chronicles of Narnia: The Horse and His Boy, there seems to be a discrepancy in the timing of events. After Shasta has given the warning to king Lune, he falls behind as their hunting party returns to the castle Anvard. Shasta then gets lost in the woods. At a fork in the road, he observes prince Rabadash giving orders to his troops. Rabadash says, “Attend, all of you. We are now within a furlong of the castle. Remember your orders. Once we are in Narnia, as we should be by sunrise….” This seems pretty clear that Rabadash attacked the castle Anvard later that night. During that night, Shasta continues along the road hoping to find someone who can help him. He runs into Aslan along that road. Once Aslan leaves, it is early in the morning - and Shasta runs into some dwarfs. They give him breakfast. (This would have been the morning after Rabadash attacked Anvard). Shasta went outside with the drwafs, and sits down. They try telling him about Narnia, but Shashta falls asleep. “He slept pretty well nearly all day but woke up in time for supper" This short passage creates the entire problem. "Next morning they had just finished breakfast when they heard a shrill, exciting sound from outside.” This was the sound of the Narnian reinforcements arriving to help defend Anvard. Later this day, they arrive and turn the tide of battle, defeating Rabadash. Ah – I see now what Rabadash and his men have been so busy at all day. They have felled and lopped a great tree and they are now coming out of the wood carrying it as a ram. They have learned something from the failure of last night’s assault. He would have been wiser if he had set his men to making ladders: but it takes too long and he is impatient. Fool that he is! He ought to have ridden back to Tashbaan as soon as the first attack failed, for his whole plan depended on speed and surprise. The hermit seems to suggest that this was the second attack. 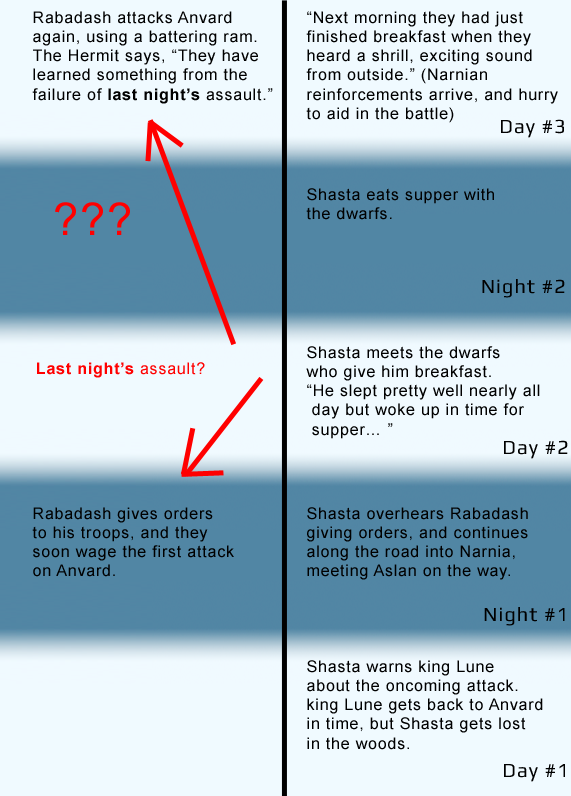 That Rabadash's first attack was only the night before - but this would have been the night after Shasta's rest and not the night after Shasta warns king Lune. I made a diagram showing the events that happened on each day/night, in case that description didn't make sense. The only thing I can conclude is either the hermit was mistaken, or Rabadash made a second attack that is not recorded - and then the attack where the Narnian reinforcements arrive to help defend Anvard was actually during Rabadash's third attack. Were either of these the case, or did something else happen that would make all of this make sense? It is entirely possible that C. S. Lewis made a mistake in setting up the timing of Rabadash's siege and assault. However, there is nothing in the text that is explicitly inconsistent. It is clear from the story that Rabadash's force of "two-hundred horse" would be sufficient to capture the capital of Archenland, if they arrived completely by surprise. However, once the defenders have been warned and taken refuge in Castle Anvard, Rabadash's plan has basically failed. Having come upon the Archenlanders in a ready state of defense, the Calormen prince decides to besiege the castle. There are various tactics than may be used during a siege. A pure siege consists of simply blocking off access to a fortress, so the inhabitants cannot get in or out. After weeks or months, the defenders will run out of food and other necessities. However, during this time, the besieging force needs to provision itself, and the besiegers' own defensive position is generally not ideal. If additional military forces allied with the defenders arrive, the besiegers can find themselves sandwiched between the new wave of attackers and the defenders in the citadel. For these reasons, it is frequently not the best strategy for the besiegers to simply wait and try to starve the defenders out. So what the hermit of the southern march appears to be describing as a previous "assault" was an earlier all-out attack on the fortifications. In all likelihood, Rabadash arrived at Anvard expecting to take the castle unawares. It it unclear what action he took initially, when he arrived on the scene and found the fortress sealed and ready to defend itself. He may or may not have ordered an immediate assault. However, knowing that reinforcements for the castle would eventually arrive, Rabadash the Ridiculous evidently decided to make frequent (perhaps once per day) assaults on the defensive positions. As his troops prepare for the latest assault, using a tree trunk ram to try to break down the castle doors, the hermit compares what is happening to the most recent previous assault, concluding that the prince has learned from his previous failure and is improving his tactics.